The way in which scholars produce and publish scholarship is changing into a more open, collaborative, and iterative process. Based on Daniel J. Cohen and Tom Scheinfeldt's open access book by the same title, the Hacking the Academy program series explores the evolution of scholarship and scholarly publishing. This program series will highlight trends in how scholarship is produced, archived, evaluated, and reused through a series of interdisciplinary showcases, discussions, and lectures. Have an idea for a Hacking the Academy program topic? Contact us at digisch@uw.edu. As researchers, we all want to make a difference -- but are we succeeding? Today, researchers across the disciplines must track and explain the impact of their work as justification for future funding, career opportunities, and basic job stability. This workshop is here to help you tackle thorny questions about why your research matters, what you can do to track and enhance your impact, and how "going public" can and should be part of your game plan. Join Robin Chin Roemer, Head of Instructional Design & Outreach Services for the University of Washington Libraries, and co-author of Meaningful Metrics: A 21st Century Librarian's Guide to Bibliometrics, Altmetrics, and Research Impact for this session. The University of Washington eScience Institute runs an annual Data Science for Social Good (DSSG) summer program. Modeled after similar programs at the University of Chicago and Georgia Tech, with elements from our own Data Science Incubator, the eScience DSSG brings together data and domain scientists to work on focused, collaborative projects that are designed to impact public policy for social benefit. Previous projects (4 in each year) have involved data analysis and visualization on topics such as transportation, public health, sustainable urban planning, homelessness, and social justice. DSSG projects are executed by a team consisting of: an external Project Lead, two Data Scientists from the eScience Institute, and four Student Fellows (graduate and advanced undergraduate) who apply through a competitive, national call. Project Leads submit the project proposals and bear primary responsibility for project design and execution. The Data Scientists provide guidance on methods, technologies, and best practices in extracting knowledge from large, noisy, and/or heterogeneous datasets, as well as general software engineering. Student responsibilities vary from project to project, but include developing code, selecting methods, conducting analyses, contributing to design, and incorporating stakeholder perspectives into the project. A team of data science ethnographers is also embedded in our program, observing and interacting with participants on a daily basis and providing valuable insights for program improvement as well as scholarly contributions to the evolving field of Data Science Studies. Throughout the summer Student Fellows and Project Leads have opportunities to participate in technical tutorials and research talks. Our recent experience running this program supports the notion that DSSG programs can both effectively impact social good and provide data science training for students across diverse domain fields. Differences in prior experience and training among student fellows can pose a challenge, but often becomes a strength in the context of project work. We have also found that stakeholder identification and involvement with end users is important to project success and longevity. We are currently accepting applications for Student Fellows for our summer 2019 DSSG program, for more information visit http://escience.washington.edu/dssg/. 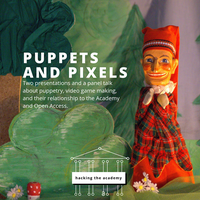 Join us for two presentations and a panel discussion about puppetry, video-game making, and their relationship to the Academy and Open Access. Before you sign on the dotted line, identify key terms of a publishing contract that determine your rights as an author. The focus will be on academic journal publishing. Presented by Maryam Fakouri, Scholarly Publishing and Outreach Librarian. Play the new board game that’s sweeping higher education around the world! Prepare to laugh as you compete for money, impact, and knowledge! Hosted by Maryam Fakouri, Scholarly Publishing and Outreach Librarian and Alyssa Berger, Research & Instruction/Science & Math Librarian, UW Bothell. Pressbooks is an easy-to-use tool for creating digital books, open textbooks and other open educational resources. Join this session to learn about using Pressbooks to create and adapt openly licensed materials in a variety of formats (EPUB, MOBI, PDF), and how to set up your account via the UW Libraries (available in early October). Presented by Lauren Ray, Open Education and Psychology Librarian. Film screening and discussion. Allen Auditorium, Allen Library North (ground floor). Released in September 2018, this 60-minute documentary examines the for-profit publishing industry and highlights some of the benefits of open access for research and science. Join us for a screening of the film followed by a brief discussion with experts in scholarly communication and academic library collections. In keeping with its theme, the film was released under a CC-BY 4.0 Creative Commons license and is openly available for anyone to view at their convenience. Presented by Gordon Aamot, Director, Scholarly Communication and Publishing; Corey Murata, Director, Collections Analysis and Strategy; and Denise Pan, Associate Dean of University Libraries for Collections and Content. The Open Access movement promotes a vision of the world where everyone has access to the scholarly record, regardless of their income or institutional affiliation. This presentation will explore the different strategies that advocates are pursuing to make this vision a reality, including some exciting efforts at the University of Washington. Presented by Liz Bedford, Scholarly Publishing and Outreach Librarian. Join us for presentations and a brief discussion! You want to get your research published, but how do you decide where to submit your work? In this workshop, we’ll discuss how to assess a journal’s quality and its fit for your research profile, while weighing issues of access and impact. Participants will get the chance to try out tools for finding and evaluating academic journals. This workshop is open to students, staff and faculty at all levels. Advance registration is greatly appreciated! Ready to publish but not sure about that long agreement the journal publisher asked you to sign? This workshop will review the key parts of a publishing contract, explaining what terms mean and their potential impact on your future research and teaching. In addition to examining sample agreements, we'll introduce tools and suggest negotiation strategies you can use to protect your rights. This workshop is open to students, staff and faculty at all levels. Advance registration is greatly appreciated! Join us for “Going Public: Connecting Research & Community” where we’ll explore engaging community in the research process through public scholarship, citizen science, community-engaged research, and participatory research. This interdisciplinary event offers an opportunity to expand your skills through several workshop offerings, to hear from researchers and community participants on their experiences through our “Research & Community Connections” panel presentation, and to see the different shapes this research can take through our graduate student poster display. Register on the Research Commons website. Are you interested in getting started with digital scholarship? Are you interested in online exhibits and want to learn more? Join us Friday, March 2nd, 2:00-3:30pm for an introduction to creating an online exhibit through the use of Omeka.net. Omeka.net allows you to create an online archive of images, dataset, media materials, and more. The best part of Omeka.net is that it doesn’t require a server install to use! This workshop will focus on the basics you’ll need to create a successful digitals scholarship project. Participants will leave the workshop having added items to their own Omeka.net sites. Join us for this active, pilot workshop event! Please register in advance for this event. The University of Washington eScience Institute runs an annual Data Science for Social Good (DSSG) summer program. Modeled after similar programs at the University of Chicago and Georgia Tech, with elements from our own Data Science Incubator, the eScience DSSG brings together data and domain scientists to work on focused, collaborative projects that are designed to impact public policy for social benefit. Previous projects (4 in each year) have involved data analysis and visualization on topics such as transportation, public health, sustainable urban planning, homelessness, and social justice. DSSG projects are executed by a team consisting of: an external Project Lead, two Data Scientists from the eScience Institute, and four Student Fellows (graduate and advanced undergraduate) who apply through a competitive, national call. Project Leads submit the project proposals and bear primary responsibility for project design and execution. The Data Scientists provide guidance on methods, technologies, and best practices in extracting knowledge from large, noisy, and/or heterogeneous datasets, as well as general software engineering. Student responsibilities vary from project to project, but include developing code, selecting methods, conducting analyses, contributing to design, and incorporating stakeholder perspectives into the project. A team of data science ethnographers is also embedded in our program, observing and interacting with participants on a daily basis and providing valuable insights for program improvement as well as scholarly contributions to the evolving field of Data Science Studies. Throughout the summer Student Fellows and Project Leads have opportunities to participate in technical tutorials and research talks. Our recent experience running this program supports the notion that DSSG programs can both effectively impact social good and provide data science training for students across diverse domain fields. Differences in prior experience and training among student fellows can pose a challenge, but often becomes a strength in the context of project work. We have also found that stakeholder identification and involvement with end users is important to project success and longevity. We are currently accepting applications for Student Fellows for our summer 2018 DSSG program, for more information visit http://escience.washington.edu/dssg/. Julian Barr is a PhD candidate in Geography at the University of Washington Seattle. He has a BA in history and a MS in geography both from the St. Louis area. He is interested in queer-feminist geography, qualitative methodology, and cultural geography with a focus on place studies and popular culture. His research is focused on the historical geography of lesbian and queer women in Seattle with a focus on place/community development. His secondary research interests include researching issues of representation of identity and place in popular culture. He and a co-author were recently published in the Journal of Popular Film and Television. Lauren is a doctoral candidate in Geography at the University of Washington. Broadly Lauren is interested in the politics of science in the context of environmental management. Her research examines the co-production of science and regulation in the West Coast commercial fisheries, and the social and political impacts of new scientific and monitoring technologies on commercial fisherman. Lauren also works at the nexus of digital humanities and science communications to understand how conservation discourse is produced and circulated on the web through social media and emerging practices of geospatial digital storytelling and carto-visual narrative. Join us for presentations and time for brief discussion! Celebrate Open Access Week with us by hearing how and why campus colleagues share their work openly. Join us for short talks by Sharon Kioko, Evans School, on co-authoring an open textbook, Ben Marwick, Anthropology, on publishing pre-prints, and Michael Degerald on his digital scholarship work making rare and hard to locate Iraqi texts publicly available. Short talks will be followed by time for your questions. Are you concerned about your own digital safety, but don’t know where to start? Join UW Librarians in an interactive conversation on safeguarding your personal data. We will create personal information maps to track our data and learn to identify risks and questions. Participants will leave with a better understanding of where their information lives and what safety priorities are most important to them. Bring your lunch and join us! The University of Washington eScience Institute runs an annual Data Science for Social Good (DSSG) summer program. Modeled after similar programs at the University of Chicago and Georgia Tech, with elements from our own Data Science Incubator, the eScience DSSG brings together data and domain scientists to work on focused, collaborative projects that are designed to impact public policy for social benefit. Previous projects (4 in each year) have involved data analysis and visualization on topics such as transportation, public health, sustainable urban planning, homelessness, and social justice. DSSG projects are executed by a team consisting of: an external Project Lead, two Data Scientists from the eScience Institute, and four Student Fellows (graduate and advanced undergraduate) who apply through a competitive, national call. Project Leads submit the project proposals and bear primary responsibility for project design and execution. The Data Scientists provide guidance on methods, technologies, and best practices in extracting knowledge from large, noisy, and/or heterogeneous datasets, as well as general software engineering. Student responsibilities vary from project to project, but include developing code, selecting methods, conducting analyses, contributing to design, and incorporating stakeholder perspectives into the project. A team of data science ethnographers is also embedded in our program, observing and interacting with participants on a daily basis and providing valuable insights for program improvement as well as scholarly contributions to the evolving field of Data Science Studies. Throughout the summer Student Fellows and Project Leads have opportunities to participate in technical tutorials and research talks. Our recent experience running this program supports the notion that DSSG programs can both effectively impact social good and provide data science training for students across diverse domain fields. Differences in prior experience and training among student fellows can pose a challenge, but often becomes a strength in the context of project work. We have also found that stakeholder identification and involvement with end users is important to project success and longevity. We are currently accepting applications for Student Fellows for our summer 2017 DSSG program, for more information visit http://escience.washington.edu/dssg/. Learn how UW researchers use citizen volunteers to create scholarship and how scholarship can effectively reach the public in this public scholarship themed program. We'll begin the program with a series of short talks followed by discussion around the theme Citizen. Come ready to learn and share your ideas and experiences with citizen science and public scholarship! Julia K. Parrish is an ecologist whose research follows three major routes: marine conservation, seabird ecology, and the ways that fish and seabirds behave when they’re in groups. A committed advocate of citizen science, she is the Executive Director of the Coastal Observation and Seabird Survey Team (COASST), a project that enlists volunteers all along the U.S. west coast to walk beaches in search of dead birds. Additionally, she is Associate Dean of Academic Affairs at the University of Washington College of the Environment. She holds the Lowell A. and Frankie L. Wakefield Endowed Professorship, is a Leopold Leadership Fellow, and more recently was one of 12 “Champions of Change.” For this she was invited to the White House to speak on public engagement in science, and scientific literacy. Dr. Parrish will speak on citizen science and the Coastal Observation and Seabird Survey Team. Dr. Vannini will speak on her work with the FotoHistorias, a participatory photography project. Derek Fulwiler is the Project Director for the University of Washington’s Population Health Initiative. He possesses more than a dozen years working in marketing, communications, and operational roles in the healthcare industry. Prior to joining the initiative, he served as Director of Communications and Marketing for the UW’s Institute of Translational Health Sciences, responsible for overseeing all of the Institute’s marketing, communication, and human resource functions. Mr. Fulwiler will speak on the UW's Population Health Initiative. Sarah Stuteville is a print and multimedia journalist and a cofounder of The Seattle Globalist. Stuteville won the 2014 Educator of the Year award from the Society of Professional Journalists Northwest, and her journalism has been honored with numerous awards including the 2014 SPJNW award for best online column, and a Sigma Delta Chi Award for magazine writing. She writes a weekly column on our region’s international connections that is shared by the Seattle Globalist and The Seattle Times and funded with a grant from Seattle International Foundation. She is a former board member of the Society of Professional Journalists, Western Washington chapter, and of Short Run Seattle. Ms. Stuteville will speak on the The Seattle Globalist's work to incorporate underrepresented voices in media reporting through training of citizen journalists. Learn more about the Simpson Center Digital Humanities Summer Fellowship program and hear three 2016 Summer Fellows talk about their work. Following a series of riots in 2009, officials in Xinjiang, an ethnically diverse province in Northwest China, announced multi-million yuan investments in "creative industries" across the region which address official goals of “ethnic harmony” and "anti-terrorism." By centering on Uyghur and Han art collectives, literary salons, film and photography studios that have been created as supplements to secular urban development, this project focuses on the way cultural expression responds to social precariousness across and within ethnic and class divides. Aimed at the intersection of urban studies and expressive culture, this digital project considers how Chinese urban minority and migrant life give rise to new forms of ethics and aesthetics. Soul Stories is a transmedia critical policy narrative that includes a print book and a long-form digital scholarship online project. It is an exploration of the boundaries of narrative within health and healing in the context of homelessness. Soul Stories deepens our understanding of trauma and resilience, the role of narrative in health, and ways we can humanize health care for patients, providers, and communities. The Soul Stories digital online project includes a collection of essays, poems, photographs, and participatory digital storytelling (DS) videos. For this fellowship, Ensign expands the scope of the digital online component and complete the series of community-based participatory DS videos. Seattle’s Freeway Revolt is a short documentary and an interactive digital archive illuminating the historical, social, and political contexts of the freeway revolts in Seattle and beyond. The interactive digital archive will feature oral histories—short, edited video interviews with activists, politicians, and others involved in the freeway revolt—and will serve as a repository of video and audio recordings of citizen testimony, maps, and other illustrative and written documents, with links to related resources. Celebrate Open Access Week by hearing how faculty on-campus are working to keep their work open. We'll begin the program with some short talks followed by time for discussion around the theme "open in action." Come ready to learn and share your ideas! Rachel Arteaga currently serves as Assistant Director of the Simpson Center for the Humanities and Assistant Program Director for “Reimagining the Humanities PhD and Reaching New Publics,” a new initiative at the Simpson Center funded by the Andrew W. Mellon Foundation. She completed the Certificate in Public Scholarship in 2015 and the PhD in English in 2016 at the University of Washington. Her work extends new approaches to reading texts developed in the digital humanities to the high school English classroom through collaborative curriculum development with teachers in rural southwest Washington, an area of the region that has been historically disconnected from higher education. Dr. Arteaga will be speaking on public scholarship. Steven Roberts, the Kenneth K. Chew Endowed Professor in the School of Aquatic and Fishery Sciences, received his Ph.D. in Biology at the University of Notre Dame in 2002. His main research interest is the physiological response of aquatic species to environmental change with a particular focus on environmental epigenetics, reproductive biology, and aquaculture. A large part of his lab's research activity includes analysis of large genomic datasets. In doing this, they practice open notebook science, strive to make all data analysis easily reproducible, and hold open online lab meetings. Dr. Roberts will be speaking on open science. Dan Berger is an assistant professor of comparative ethnic studies at UW Bothell and adjunct affiliate professor of history at UW Seattle. His most recent book is Captive Nation: Black Prison Organizing in the Civil Rights Era. Dr. Berger will be speaking on public scholarship. He has published four books and more than 75 articles on various topics in public financial management, including capital budgeting and finance, state and local tax policy, public pensions and legacy costs, government financial transparency, and public-private partnerships, and his work has appeared in the top scholarly outlets in public finance, public administration, health care management, transportation finance, and governmental accounting. Several foundations and professional associations have supported his work, including the Bill and Melinda Gates Foundation, the Robert Wood Johnson Foundation, and the International City/County Management Association. His column in Governing magazine is read by thousands of state and local policymakers, and he is lead author of Governing's popular Guide to Financial Literacy series for public officials. Professor Marlowe will speak on his work designing an open textbook.